Ron Buck of Port Saint Lucie, Fla., leads the co-angler division with five bass weighing 23-12, followed by Aymon Wilcox of Lauderdale Lakes, Fla., in second place with five bass weighing 22-9. Tommy Lee of Canada, Ont., caught the Snickers® Peanut Butter Squared Big Bass weighing 8-5 in the co-angler division to win $250. 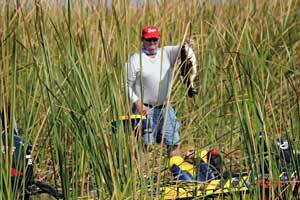 Overall there were 765 bass weighing 1,700 pounds, 12 ounces caught by 159 co-anglers Thursday. The catch included 145 five-bass limits. Co-anglers are fishing for a top award of $25,000 this week plus valuable points that could help them qualify for the Forrest Wood Cup in 2012.The top five co-anglers from the four Walmart FLW Tour Open tournaments will advance. Anglers will take off from Roland & Mary Ann Martin’s Marina & Resort located at 920 East Del Monte Ave. in Clewiston at 7 each morning. Friday’s weigh-in will be held at the marina beginning at 3 p.m. Saturday and Sunday’s final weigh-in will be held at Walmart located at 1005 West Sugarland Hwy. in Clewiston beginning at 4 p.m. Fans will be treated to the FLW Outdoors Expo at Walmart in Clewiston on Saturday and Sunday from noon to 4 p.m. prior to the final weigh-ins. The Expo includes Ranger boat simulators, the opportunity to interact with professional anglers, enjoy interactive games, activities and giveaways provided by sponsors, and learn more about the sport of fishing and other outdoor activities. Plus, fans can enjoy a free performance by up-and-coming country star Colt Ford on Sunday at 3 p.m. prior to the final weigh-in. All activities are free and open to the public. Coverage of the Lake Okeechobee tournament will be broadcast in high-definition (HD) on VERSUS. “FLW Outdoors”, will air March 20 from 1 to 2 p.m. ET. “FLW Outdoors,” hosted by Jason Harper, is broadcast to approximately 500 million households worldwide.